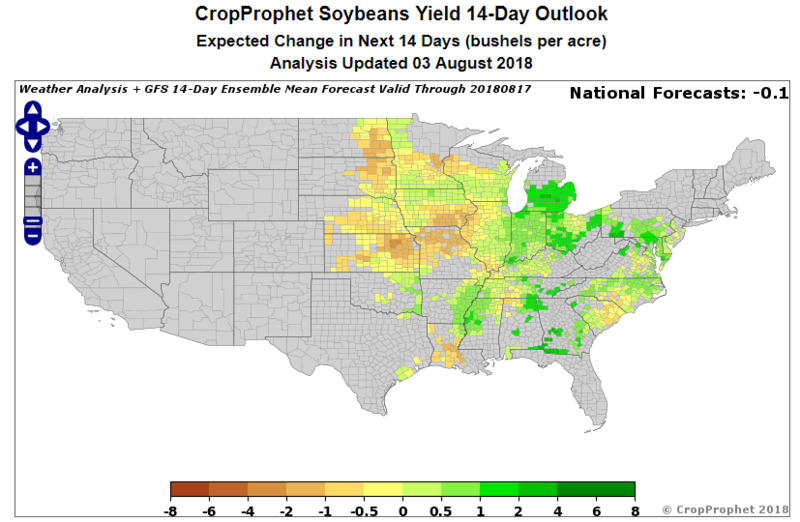 Throughout July the difference between our “year-to-date” forecast and the impact of the 14-day weather forecast suggested weather was supporting yield development. The last 5 days have seen this difference decrease. It’s likely the biggest increases in yields forecasts have already occurred. However, weather can still impact the final estimates of corn and soybean yields. CropProphet provides tools such as this to allow for analysis of Corn and Soybean yield forecasts. 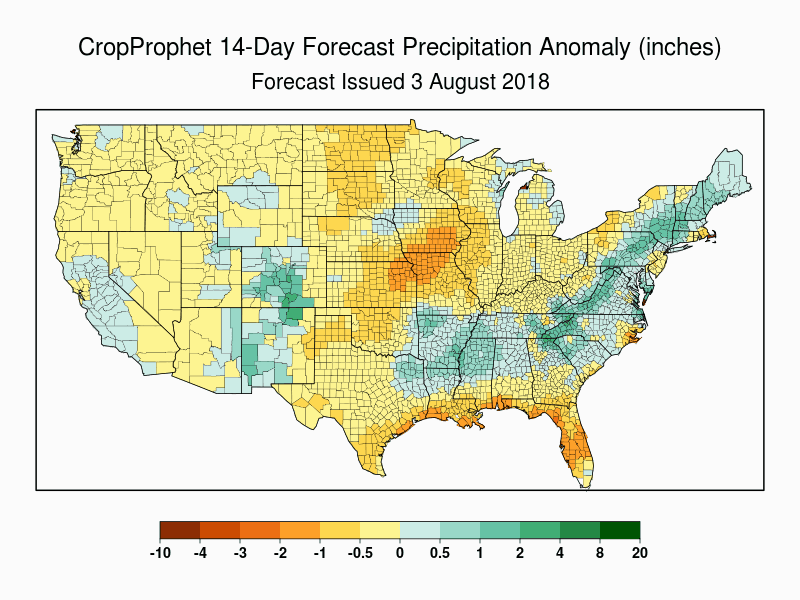 In this update we look at the impact of the 14 day weather forecasts as of August 2nd, 2018 and it’s impact on Corn and Soybean yield forecasts. “Year-to-date” yield forecast = A corn and soybean yield forecast based on everything we know has happened weather wise so far this crop growing season. 14-day yield forecast = A yield forecast from the YTD information plus the 14-day weather forecast. 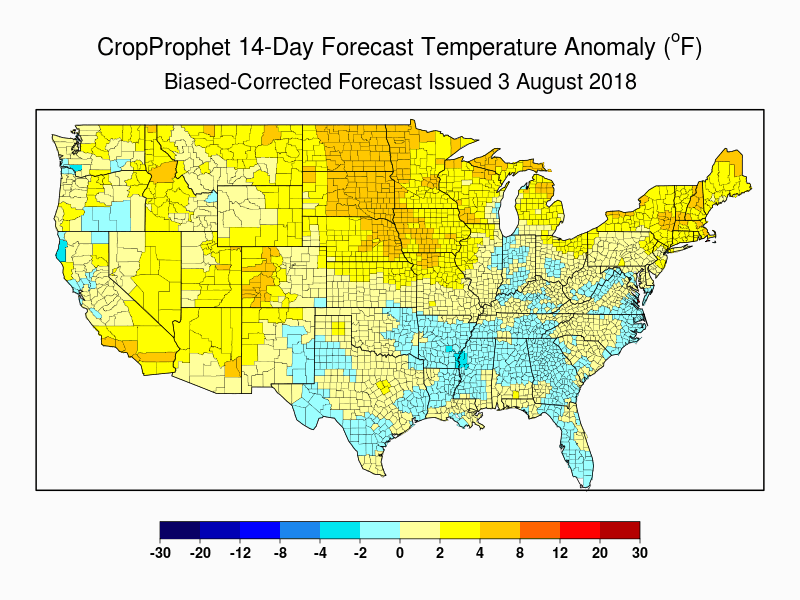 Looking at the difference between the YTD and the 14-day yield forecast allows us to quantify the impact of the weather forecast on national yield estimates. Today’s forecast temperature and precipitation over the next 14 days is shown below. We transform them into anomalies relative to normal so to make it easier to interpret and provide more context. The map below shows the impact of the 14 day GFS Ensemble average weather forecast and it’s impact on the corn yield forecast. 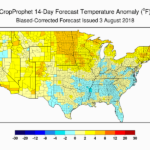 The heat of the upper midwest is negatively impacting yields there while the cool to normal temperatures in Ohio are clearly benefiting yields there. The chart below shows the daily progression of the 14 day weather forecast impact on the CropProphet corn yield forecast, in bushels per acre. It is the daily progression of the number that shows up in the upper right hand corner. In other words, it is the national impact of the 14 day weather forecast on corn yield forecast for each day of the growing season. We see that from late June, 2018 through July the forecast supported yield development. This was reflected in our YTD weather forecast because it increased all of July. However, the past 5 days or so have seen relatively little impact. The map below shows the impact of the 14 day GFS Ensemble average weather forecast and it’s impact on the soybean yield forecast. The heat of the upper midwest is negatively impacting yields there but not as much as it affects corn. As with corn, the cool to normal temperatures in Ohio are clearly benefiting the soybean yield forecast there. The chart below is the same as above. It is the daily progression of the 14 day weather forecast impact on the CropProphet soybean yield forecast. It is the daily progression of the number that shows up in the upper right hand corner. In other words, it is the national impact of the 14 day weather forecast on corn yield forecast for each day of the growing season. We see that from late June, 2018 through July the forecast supported yield development. This graph tells a slightly different story. The us national soybean yield forecast has been positively impacted by weather all season long. However, the past 5 days or so have also seen relatively little impact. 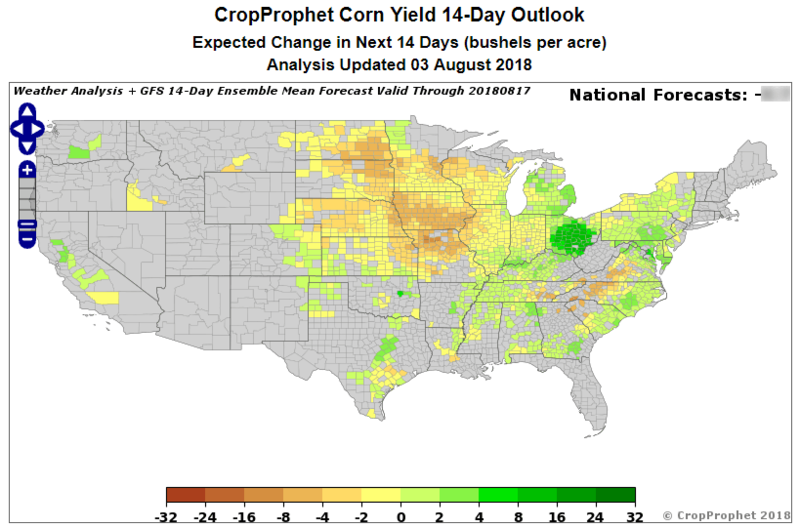 It is very likely the CropProphet yield forecasts will not change on a daily basis by the same amounts that happened during July. As we head towards the end of the season the response tends to be more muted. 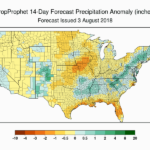 The forecasts can still change, but likely not as much as during July. Avoid the Hype. Get the Facts. Use CropProphet for your Grains Market Intelligence. This entry was posted in Corn, Soybeans. Bookmark the permalink.